Located on U.S. Highway 89 as you descend into the Bear Lake Valley from Logan Canyon. Big Hill marks one of the most difficult descents for Oregon Trail emigrants. These highway markers on U.S. Highway 30 are approximately 7 miles south of Montpelier. Paris Tabernacle in Paris, Idaho, dedicated to the team leader of a Mormon group of settlers sent by early Mormon prophet Brigham Young to settle the Bear Lake Valley. Bloomington, Idaho, dedicated to early pioneers of British descent that settled the Bear Lake Valley. St. Charles, Idaho, honors the birthplace of the sculptor of Mt. Rushmore. The story about Peg Leg Smith could be taken out of the folk tales of the west. Rumored to cut off his own leg after being wounded in a battle with Indians, Smith started a trading post that also was storied to include selling back stolen livestock to Oregon Trail travelers. Married to Chief Walkara’s daughter Mountain Fawn, Smith supposedly buried her on the east side of Bear Lake overlooking the beautiful view and guarding a small treasure that was buried with her. This marker is located approximately 6 miles south of Montpelier on U.S. Highway 30. Marks the site of mountain men rendezvous held in the Bear Lake Valley during the summers of 1826 and 1827. 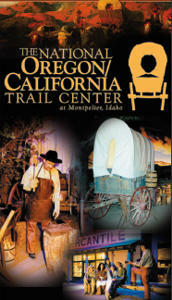 Famous mountain men such as Jim Bridger, Jedediah Smith and William Ashley attended this well known rendezvous. Randolph, Utah, is dedicated to veterans of foreign wars.